Celebrating the next generation of global changemakers for mental health system innovation! The Global MINDS Fellowship Program (GMFP) is a year-long opportunity for highly qualified applicants with diverse academic backgrounds and skills to collaborate in international transdisciplinary teams to catalyze the development, implementation, mobilization and evaluation of disruptive solutions for the wicked problem of reducing the global burden of mental and substance use disorders and related issues. The first GMFP (2017-18) was held in Kenya, with its cohort of Fellows focused on developing solutions for the East African context. The second GMFP (2018-19) was held in London, Canada, focused on incubating innovative solutions with and for local communities facing marginalization, including mental health inequities. The third GMFP (2019-20) is available to a global audience, focused on creating disruptive solutions for mental health system challenges in local and global contexts. GMFP 2019-20 applications are OPEN NOW and have been extended! Applications will be accepted on a rolling basis until April 15th, 2019 at 5:00pm EST. Individuals (studets and recent graduates) from any academic discipline are welcome to apply (e.g. education, psychology, humanities, social sciences, math and science, engineering, business, medicine, law, information and media studies etc.). The Pre-Summer Institute Orientation prepares Fellows for the journey that they will soon embark on and welcomes them to the Global MINDS family. Through team-building activities, storytelling and an exploration of skills and competencies, Fellows are introduced to introduced to the Philosophy of Global MINDS, to the Global MINDS Faculty and Mentors, and to each other, while beginning to conceptualize and reflect on their unique and individual strengths and that make up the larger GMFP community. Fellows will also prepare for the Summer Institute in advance by having access to foundational learning materials (e.g. readings and teaching videos). Over an intensive ten-day period, Fellows will be tasked to develop a “disruptive solution” for their complex mental health system challenge. Fellows will engage in an immersive curriculum of sense-making exercises (system mapping, stakeholder analysis), developing iterative complex challenge questions and briefs, determining personal and team impact statements, and designing implementation, evaluation and sustainability strategies. Professional capacity building opportunities are integrated into the curriculum, including daily mindfulness and reflection sessions, cultural exchange, larger group and team-building activities, and focused, interactive learning on topics such as public speaking and system leadership development. Fellows will have opportunities to connect online with their Faculty and Community Partner throughout the Summer Institute. The Summer Institute ends with a “Disruptive Solutions Final Pitch Event,” where Fellows will pitch their triad-team’s final solution to the Global MINDS faculty and staff for rapid feedback. Faculty and Community Partners will be welcome to attend this session virtually. The GMFP 2019-20 Summer Institute will conclude with a “Showcase & Networking Celebration Event,” which will include alumni, faculty, university leadership and public officials, and other members of the community. Following the Summer Institute, teams engage in self-directed processes to implement, evaluate and disseminate their project solutions over the year. To support this work, Coaching and Mentorship will be available throughout the year. Teams will also have an opportunity to engage in Knowledge Mobilization efforts, including blogging and podcasting. Finally, an immersive webinar will be held to celebrate the learnings and impact of the GMFP 2019-20! As students, GMFP Fellows excel academically, and demonstrate interest in mental health and positive social change. They are motivated by a genuine sense of compassion for others and a drive for using innovative approaches to tackling complex challenges. 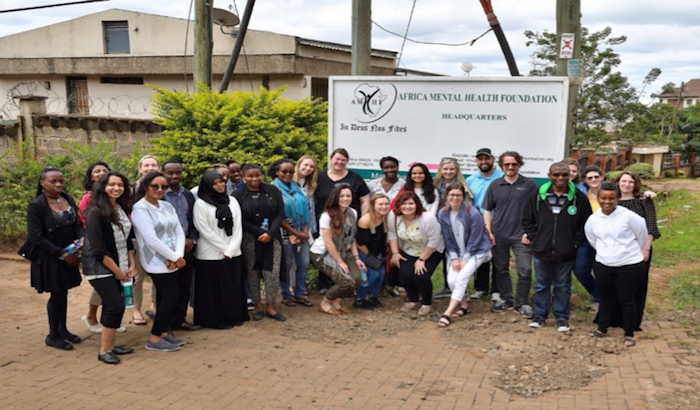 Fellows are supported by alumni Fellows, faculty, researchers, community leaders, and community partner representatives from a global setting, including from Western University and the Africa Mental Health Foundation. Together, their expertise spans an array of diverse fields of knowledge (including mental health, social innovation, information and media studies, education, business, and population health), demonstrating our approach for transdisciplinary collaboration in tackling dynamic and emergent complex challenges.